WE HAVE A WINNER - Congrats to Julie Craswell #1031 who has won $2223. NO WINNER -Jacques Caissie #1033 could have won $1186. NO WINNER - Brandy Stephens #1797 could have won $970. 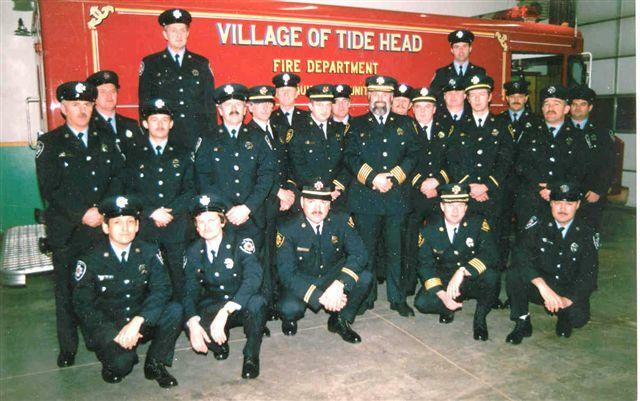 Tide Head Fire Dept….the early years. The move to create a fire dept was started by Alan Dickson, a meeting was held to see if there was any interest in forming a brigade, a sheet of paper was passed around and people were asked to sign and with the 38 names on this list, there was. So it would be safe to say that the Tide Head Fire Brigade became a reality on May 22, 1980 with the first election of Chief and officers. Everyone that became a member gave five dollars to start off the brigade. At this time the village had a 1957 Chev tanker, this was an ex forestry unit that the village had obtained years earlier. This unit was in very bad shape with no brakes and missing parts. With a little work it was placed into service and stored in the fire hall which was used as a community hall located just east of the present school. The floor was blocked up to hold the weight of a truck full of water. It wasn't very long before another truck arrived, this one was a 1966 GMC 6 cylinder forestry tanker but it had a leaking tank...it was learned that the tank on the 57 was in better shape so a swap was in order. With the 66 GMC having a tank that didn't leak it was sent off to a welding shop in Atholville for compartments to be welded to the sides of the tanks for equipment. We purchased two Scott air packs with 2 spare air tanks, some nozzles and hose and we were in the fire fighting business...not much money floating around for fire protection back then. A lot of work was done on the GMC by the members and required parts would sometimes just sort of show up. We still didn't have a siren (imagine a fire truck without a siren) and if by magic one day we arrived at the fire hall to find an old chrome plated air siren sitting on the seat of the truck (no one asked where it came from but we had some ideas)...now we had a complete truck. We got a donation of some used turn out gear from both the Campbellton Fire Dept and the Atholville paper mill. We had to buy boots and helmits but there wasn't enough for everyone....boots were in compartments labeled by size...so you shared boots, coats, gloves and helmits and later on when everyone had their own turnout gear it was kept in the firefighters cars, we needed an equipment van which would come later as we had more important things on our wish list. The next thing was training....no one really knew anything about fighting a fire,.you just applied water to it somewhere. Oh how we worked at learning to be a firefighter....hours of training and the errors that went with it, like the training session that we laid 500 feet of 1 1/2 inch hose backwards...that didn't work but we did learn how to load hose on a truck properly and all about reverse couplings. But learn we did and studied for months and wrote our level one firefighter exams and became a very well trained and dedicated group. In 1982 a new fire hall was built on Mountain Street which also held the village offices. . Also we acquired a real honest to goodness fire truck. It came from MetalFab in Centerville New Brunswick this was a 1981 Chev pumper 625 gpm pump with 800 gallon water tank...they had just started making fire trucks. Our unit was the first fire truck they had made that received ULC approval this was Metalfab’s demo truck and spend about a year running around Atlantic Canada being shown to customers and in parades. This unit is still with us as our second pumper (No. 2) and out of town truck. Our inventory of equipment was growing with more air packs (SCBA) and tanks, new turn out gear, radio equipment, nozzles and lots of hose and we went from a phone system to pagers for fire calls. About this time an equipment van was in the plans and we found a unit that was used in the sale of auto parts. This was converted by much hard work by the members and in those years we had a lot of expertise in our membership, there were radio techs, welders, painters, mechanics, electricians, bankers, forest rangers, carpenters, you name it and we had somebody that did it for a living.....The van needed body work. paint and had to be wired for lights, siren (oh yes, this unit got a real light bar with electronic siren) Compartments were built inside to hold everyone’s gear and we had room for our power saws, first air kits, spare air tanks etc. (and by now everyone had their own turnout gear) Training was right up there and when we got an alarm, we were gone. But no one could beat Capt. Wayne Mann for being the first guy at the fire station, we always figured he slept with his boots on and standing by the door. So with a new fire hall, new pumper, our old 66 tanker and our equipment van things were looking good. A bingo was created as a fund raiser for the brigade and was a success, this money was used to help build an addition on the the fire hall, many pieces of new equipment and years later help purchase a new equipment van. The bingo is now gone but was replaced by a half and half draw. In 1997 a new Ford pumper was purchased from MetalFab and old faitfull our 1966 GMC was retired, it went to the village maintenance dept and had it's tank removed and a flatbed added. Later on it was equipped with a large diesel generator for back up power for the village water system, the generator was moved into it’s own building and now is used for back up electricly for both the water system and municipal buildings and the old truck was sold. In 1990 an new Ford equipment unit was purchased and the body was built by Dymanic Fibers and the old van sold with the exception of one part (remember the light bar with the real siren) well it was transferred to the new van. So over the years from it’s humble birth to the up to date, well trained fire dept of today it has served the village and it’s residents well.